Technology being what it is.. that is, always changing, I have been in a tech gap for awhile. I had hoped to be able to move everything from this set of blogs into Google+ but the lack of connectivity bandwidth and the ongoing changes in Google's platforms and requirements has had me chasing a butterfly. I don't doubt that I will be able to do this...eventually, and until then, I will still post my daily content in Google+. It is far more consistent and easier to manage. Unfortunately, it is still so misunderstood by so many that they don't want anything to do with it. It is not Facebook but does have a social media aspect, which can be ignored if you choose. In the meantime, I will occasionally update these blogs with useful but less than timely information. Just to keep a thread of interest going until the tech makes it easier and more appealing to move to G+... or somewhere else. The past year has been mostly about our travels with some extended stays in places we liked (except for Fallon, NV). While staying in Fallon, NV, we had some nice weather, but also some very un-nice weather with temps dropping to -19 and some snow. A couple of nights I had to keep the Precision Temp demand Hot water heater defrosted with a hair dryer. Batt Insulation didn't even completely prevent it from freezing, but nothing broke or leaked. I added a complete bypass kit to it so I could at least, completely empty the whole thing if it ever got this cold again... but it hasn't. We wrapped up our Fallon Stay (Remember, Merrily was working at Amazon in Fernley, nv) on Dec 18, 2013 and we headed up to Lake Tahoe the next day. We spent Christmas week in Lake Tahoe South Tahoe Village Campground, but Merrily was bad sick the whole time so not much fun. 12/27/2013 saw us move to the lower and warmer Redding, Ca. We stayed at the Premier Resorts RV park in North Redding and loved it so much that we stayed there until April 5, 2014. The weather was great and so were the people. Redding has never been a destination for me but it was so convenient that when we moved on to Arcata, CA, it was with a lot of reluctance. A few nights in Trinidad, Ca which was a waste and then we moved on up the coast staying only a few days to a week in places like Klamath, CA, and Crescent City (Actually, Hiouchi Hamlet just 5 miles east of CC). The Jedediah Smith Redwoods State and National Park was fantastic! 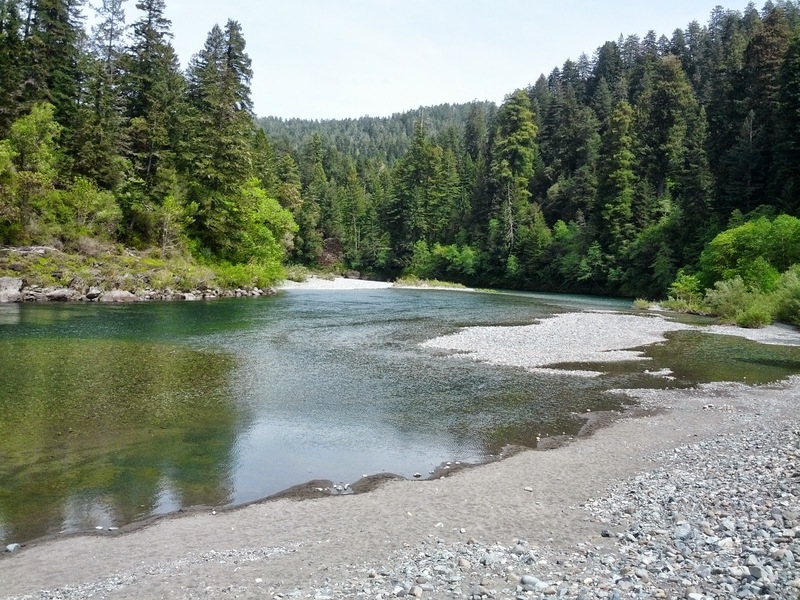 Hiouchi RV park is right on the eastern edge of this National Park and daily excursions into the groves of original growth Redwoods always left us wanting even more. When we finally left Hiouchi RV Park our next stop was Gold Beach, OR and we stayed right on the beach at Ireland's Ocean View RV Park. That was a really nice small park and we really liked the Gold Beach area, too. Not nearly as touristy as Brookings. If you recall, our west coast goal was Port Orford and we finally made it there but did not stay. A day trip to it showed it to be interestingly small and insufficient in our kinds of resources so we planned to continue on up to Bandon, OR. Bandon by the Sea RV Park in Bandon, OR was nice with big pull through sites. Weather was pretty blustery while we were there for a few days but it was exhilarating to walk the overlooks at the point at elephant rock. Coos Bay had long been pulling us as a prospective long term place to stay but a week there, though very interesting, left us still wanting a better matchup of our needs and wants to available local resources. We stopped in Coos Bay at AAA Midway RV Park which was very well kept with dense hedgerows between the sites but there were only 2 pull through sites we could fit into. It worked out perfectly for us, though, and we spent a week there checking out the area and the history of Coos Bay. Lots of interesting things we didn't get around to at that time but reason enough to come back. We moved on to Woahink Lake RV park where the huge coastal dunes sprung right out of the back row of RV sites. Man, these things are huge and maybe 150 feet to the top of the nearest ones. The ocean is at least a crow's mile from there, across the dunes. Obviously, a big ATV recreation area.. These things are awesome to see and climb. Katie loved the unlimited running and digging and for the first time really learned what off leash really can mean. A few days later, we moved on to Seal Rocks RV Cove in Seal Rocks, OR. This was just the opposite. The cove was just across highway 101 with a short path and steps down to the large tidal pools area that all but disappeared at high tides. Great little place. Yes, there is highway noise during the day but the scenery and beach makes up for most of it. We found an ICE cream/fudge shop that makes the best brownies and ice cream. Good thing we didn't discover it until the next to the last day there. By this time it was getting close to our May 20th destination in Lincoln City so we could not dawdle as we would have liked. On May 20th we made our last short term move into the Premier Resorts RV park in Lincoln City, Oregon. It is a sister park to the one where we had stayed in Redding, CA, just after Christmas. One of the very best parks so far. Unfortunately, for how well it is run, the concrete parking pads and sites are all sized for RVs with no slides so we have to park our truck in different places depending on how full the park is expected to be. sometimes it is parked out on the street. Merrily flew out of portland a few days later to visit the kids and doctors for a few weeks and Katie and I stayed and just soaked up the Lincoln City ambience. The beach is 2 blocks away and across US Hiway 101 but that was not a problem. The weather was fantastic! High temps were generally in the upper 60s to mid 70s and nights plummeted <grin> to the mid to upper 50s. Neither heat nor A/C hardly ever ran and each day we got in at least a 1 mile walk along the cliffs overlooking the beach. But we had an agenda so after extending our stay twice, we finally left Lincoln City for Astoria, OR. on 9/19/2014. Though we had previously made a scouting trip from Lincoln City to Tillamook and toured the Tillamook Cheese factory, we had to stop again just for a great butterscotch sunday as we passed through. Astoria, Or 9/11/2014: What a great place! Called Little San Francisco, it really is like its namesake. Hills, a tower, legendary river mouth, massive port for commerce and flush with nostalgic cultural roots. We have "played tourist" more in the short time we have been in Astoria than anyplace we have yet visited. We planned for a week's stay and figured that might be a bit too long but we have already extended our stay to another week. So, that is our catch up history since Leaving Fallon Nevada. I have been posting most of my day to day pictures and adventures on Google+ because it gives me a lot more control, automatically does a lot of things, like photo enhancements, panoramas and neat little stories. All the pictures I take with my SmartPhone automatically go up to my G+ photo albums as I take them so I just pick the ones I want, stick in some description and then post them to my circles of family, friends and rving buddies groups. Far more details are available in my Google+ posts along with a lot of pictures and movies of places and events. Just click this link: Budd Nash or go to Plus.google.com and search for Budd Nash.